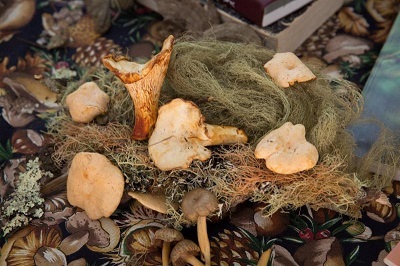 Big Sur, CA, September 18, 2018 – The historic Big Sur River Inn serves as the host and backdrop of one of the Big Sur Foragers Festival’s most popular events, the “Fungus Face-Off,” set for Saturday, Jan. 19, 2019. Big Sur Foragers Festival is excited to announce the return of their feature venue, the Fungus Face Off, to longtime partner, Ventana Big Sur, for 2018. Salinas, CA, November 21, 2017 – Big Sur Foragers Festival is excited to announce the return of their feature venue, the Fungus Face Off, to longtime partner, Ventana Big Sur, for 2018. The community’s non-profit, Big Sur Health Center, will receive the proceeds from all of the festival events to help support the continued presence of local healthcare services in the Big Sur area. Big Sur, CA, November 05, 2016 – The Big Sur Foragers Festival may have changed the location of its annual Grand Chef Dinner for 2017, but the event’s culinary star power remains intact. With a resort enhancement project in development at Ventana Big Sur, the festival moved its spectacular wine dinner to sister resort Carmel Valley Ranch, which was just named the No. 1 resort in Northern California in the Conde Nast Traveler 2016 Readers’ Choice Awards. Tim Wood, executive chef of Carmel Valley Ranch and the driving force behind its award-winning Valley Kitchen Restaurant, will co-host the January 15 event along with high-profile chef and restaurateur Rodney Worth, who owns six restaurants in the San Francisco East Bay and The Pear Southern Bistro in downtown Napa. These two culinary contemporaries have much in common, as Wood and Worth each carry out a farm-to-table approach using local, sustainable ingredients, and are passionate supporters of sustainability initiatives including the Monterey Bay Aquarium’s Seafood Watch program. An intimate forage-inspired feast paired with incredible wines, the multi-course dinner from Chefs Wood and Worth begins at 6 p.m., and seating is extremely limited. Early-bird tickets on Eventbrite cost $150 if purchased before November 30 ($175 beginning December 1). Carmel Valley Ranch will also host the Foragers Festival’s popular Fungus Face-Off on Saturday, January 14, in a beautiful tented setting on the resort’s Pete Dye-designed golf course. This popular event sells out early. There are 250 available tickets, priced at $65 per person. The price includes samples of foraged foods prepared by local chefs, award winning local wines to taste and samplings of local craft beers. A selection of handcrafted items will also be available for purchase from local artisan vendors. Big Sur Health Center announces January 13–15, 2017, as the dates for its annual Big Sur Foragers Festival. Salinas, CA, November 02, 2016 – Big Sur Health Center announces January 13–15, 2017, as the dates for its annual Big Sur Foragers Festival. This year’s partners include Carmel Valley Ranch, the sister property of longtime host Ventana Big Sur that was just named the No. 1 resort in Northern California in the Conde Nast Traveler 2016 Readers’ Choice Awards. With a resort enhancement project underway at Ventana Big Sur, the Fungus Face-Off and Grand Chef dinner will take place this year at Carmel Valley Ranch, a summer-camp-inspired resort that sprawls across 500 acres and celebrates a deep connection to the land of Carmel Valley. The event has traditionally served as a fundraiser for the Big Sur Health Center. The community’s non-profit health center will receive the proceeds from the foraging events to help support the continued presence of local healthcare services in the Big Sur area. ● A Friday night winemaker dinner series will be held at select restaurants throughout Monterey County. La Balena in Carmel will participate, donating 20 percent of the proceeds to the Health Center. Will’s Fargo Restaurant + Bar in Carmel Valley and Alvarado Street Brewery and Grill in Monterey will each donate 10 percent. The Big Sur River Inn will hold a forager-themed brunch, also donating a percentage of profits to the event. ● A vendor’s market will take place following the Fungus Face Off Saturday, January 14th from 1-4 p.m. Meet the local artisans during the Face Off, then shop at the market from 4-5:30 p.m. Each vendor-partner will donate a portion of their sales to the Big Sur Health Center. ● Carmel Honey Company: Jake Reisdorf’s fifth-grade report on bees developed into a successful business model with a non-profit component. Meet young Jake and his mom Becky as they detail the wonders of honeybees. ● The Quail and Olive: Board-certified cardiologist Dr. Stephen Brabeck long recognized the health benefits of olive oil so he started a successful local business centered around a California olive oil experience. ● Salt Roots Soap Company: Meet Stephanie Wise, who started this unique artisan company with her friend Shani Fridrich. Their soaps are handmade in small batches, which creates unique beauty in the variations of design, texture and color. ● Big Sur Sea Salt: Anna Linden runs this new startup, taking advantage of the natural bounty that comes from pristine seawater along the Big Sur Coast. ● An exclusive Friday night dinner at Sierra Mar restaurant at Post Ranch Inn with a special menu and a unique opportunity to enjoy wines from their award-winning wine cellar. This event is limited to 14 people. ● The “Fungus Face-Off” will take place in a beautiful tented setting on the Pete Dye-designed golf course at Carmel Valley Ranch. This popular event sells out early. There are 250 available tickets, priced at $65 per person. Grand Chef Dinner at Carmel Valley Ranch — details to be announced soon. Two foraging walks led by Steve Copeland and his expert team from Big Sur Guides. An easy “Wild Mushroom Walk and Talk” at Pfeiffer State Park and a nearby intermediate walk. This year, both hikes will be held on Sunday. There are 30 spaces available per walk. Tickets are $60 per person. For event details visit www.bigsurforagersfestival.org. Tickets can be purchased at https://www.eventbrite.com/e/big-sur-foragers-festival-2017-tickets-26923723582.